Eighteen scripture based songs for children that help teach the Bible with catchy tunes and simple words that 5 to 10s enjoy and remember. These songs inlcude important scriptures, stories, themes and truths including 'The Lord is My Shepherd' Psalm 23, The Lord’s Prayer and John 3:16. Christian concepts such as ‘Sowing and Reaping’, ‘Caring for Others’ and ‘Seeking Forgiveness’ are presented with age appropriate words, tunes and teaching. The album includes 16 backing tracks with accompaniment only - for school, Sunday school, holiday club and family sing-alongs. The sheet music is also available for all of the songs that will be enjoyed by children age 5-10 years. 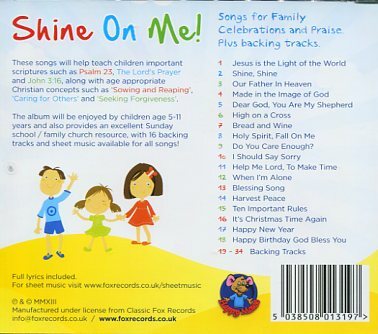 Shine On Me CD by Various Artists was published by Classic Fox in March 2013 and is our 5324th best seller. 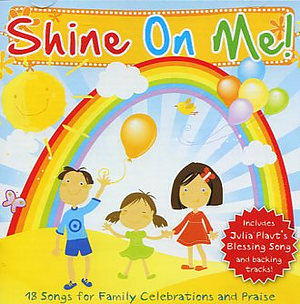 The ISBN for Shine On Me CD is 5038508013197. Be the first to review Shine On Me CD! Got a question? No problem! Just click here to ask us about Shine On Me CD. These songs will help teach children important scriptures such as Psalm 23, The Lord's Prayer and John 3:16, along with age appropriate Christian concepts such as 'Sowing and Reaping', 'Caring for Others' and 'Seeking Forgiveness'. The album will be enjoyed by children age 5-11 years and also provides an excellent Sunday school/family church resource, with 16 backing tracks and sheet music available for all songs! Now Playing: Jesus is the Light of the World Your browser does not support the audio element.